Henri Cartier-Bresson, part of Thames & Hudson's New Horizons series of pocket-sized art books, is a short study of the master photographer, written by Clement Cheroux. The book is largely biographical, though there's also a chapter analysing Cartier-Bresson's visual style. Reproductions of ephemera such as documents and stamps add to the book's charm. 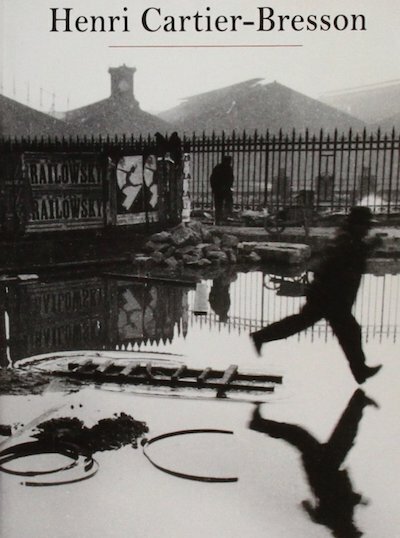 The cover shows Cartier-Bresson's most famous photograph, Derriere La Gare St Lazare: a man jumping into a puddle. The book was originally published in French, subtitled Le Tir Photographique. Cheroux (the editor of Paparazzi!) has also written several other works on Cartier-Bresson: Here & Now, Henri Cartier-Bresson, a booklet on The Decisive Moment, and Interviews & Conversations 1951-1998.